Overall size of print approx 20" x 28" / 53cms x 71cms. Flt. Lt. Geoff ‘Boy’ Wellum leads this flight of Spitfires from 92 Squadron in a scramble to take on the might of the German Luftwaffe during the height of the Battle of Britain. No 92 Squadron was first formed on the 1st September 1917 at London Colney and was disbanded on 7th August 1919. Following the outbreak of the Second World War 92 Squadron reformed on 10th October 1939 at RAF Tangmere and first saw action over the Dunkirk evacuation beaches. The Squadron was the first into action on September 15, 1940, now known as Battle of Britain Day. Towards the end of the Battle of Britain 92 Squadron flew from Biggin Hill. By the end of 1940 the Squadron tally stood at 127 German aircraft destroyed. The Primary Edition is signed by former Battle of Britain pilot Geoffrey Wellum DFC. 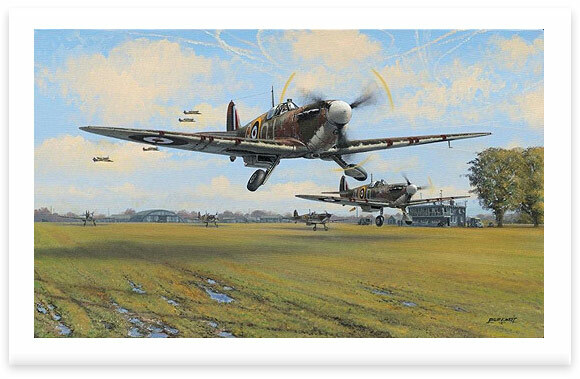 Artist Proof and Remarque Editions are signed by two additional Battle of Britain pilots. Squadron Leader Geoffrey Wellum DFC joined the RAF with a Short Service Commission in August 1939. He joined no 92 Squadron flying Spitfires in June 1940 at the time of Dunkirk. He flew throughout the Battle of Britain, later completing over 50 fighter sweeps and escorts over northern France and Belgium until August 1941. He then joined 65 Squadron as Flight Commander in March 1942 operating over northern France and flew off Aircraft Carrier Furious on operation Pedestal, to Malta. (Geoff was a Flt. Lt. during “Operation Pedestal”) He returned to the UK as a test pilot Gloster Aircraft and finished the war as a Pilot Attack Instructor. Geoffrey Wellum was credited with three destroyed, four probables and several damaged and was awarded the DFC in July 1941. The Artist Proof and Remarque editions have also been signed by the artist and these two additional distinguished Battle of Britain pilots. Wing Commander Tom Neil DFC* AFC AE was one of the RAF’s most successful fighter pilots, credited with the destruction of more than 17 enemy aircraft, the majority of which during the Battle of Britain. He went on to see further combat in Malta before returning to the UK to fly Spitfires over the Channel and elsewhere during 1943. Attached to the American 9th Air Force in 1944, he took part in the invasion of Normandy and remained with the USAAF until the border of Germany was reached. Later, he briefly saw action in Burma. Group Captain Allan Richard Wright DFC*was born Devon 12 Feb 1920. He entered RAF College Cranwell as Flight Cadet April 1938. After training Allan was posted to 92 Sqdn at Tangmere on 27 October. Over Dunkirk on 23 May 1940 he destroyed a Me110 and possibly two more, on the 24th a possible He111 and on 2 June a confirmed Me109. During the Battle of Britain he destroyed a He111 on 14 August, a He111 at night over Bristol on 29 August, a He111 and Me109 on 11 Sept, a He111 on the 14th, a Me109 on the 15th, a Ju88 on the 19th, a Do17 on the 26th, a Ju88 on the 27th plus damaging a He111, a Do17, two Ju88’s, two Me109’s on the 30th. On 30 Sept he was shot down wounded near Brighton and hospitalised. An award of the DFC was made on 22 October 1940. On 6 December 1940 he destroyed a Me109. By July 1941 Wright had destroyed 6 more Me109’s and received a bar to the DFC on 15 July. Service at HQ Fighter Command and as an instructor followed until being posted to 29 Squadron at West Malling in March 1943 where he destroyed a Ju88 on 3 April. Further command postings saw him through the war and post-war till 12 February 1967 when he retired as a Group Captain.